Kate Grable appears to be just your typical geeky high school girl - except she's not. As an aspiring medical student, she serves as an assistant to the football team. But when she discovers that the coach is injecting players with steroids, she immediately wants to find a way to out him for putting his players in danger. But steroids would have been a blessing compared to what Kate discovers has been injected into these players - some sort of virus that turns them into zombies! It is up to Kate to find a cure for this zombie virus or soon her entire school will be full of flesh-eating zombies. First off, I just want to get this out of the way: I hate zombies. I don't watch zombie movies and I certainly don't read zombie novels. But two things gave me pause and made me want to read this one. First off, Carrie Harris is from Michigan and I like supporting authors from my home state. Secondly, I have heard that this is not your run-of-the-mill zombie novel. And it's not. It's funny, it doesn't take itself too seriously, and it has a smart and quirky main character. 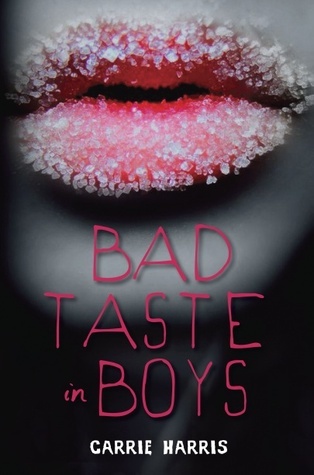 Despite normally hating zombie novels, Bad Taste in Boys defied convention and kept me turning the pages, desperate to know how the heroine was going save her all classmates from turning undead and turn the already undead alive again. The only thing that kept me from completely loving this novel is that I have a very weak constitution and the gore factor, no matter how funny, was just a little much for me. Having said that, if you think you are not a zombie person, I guarantee that this book will still keep you entertained and turning the pages well past your bed time. I've been wanting to read this book for awhile now and I absolutely LOVE the cover! I actually like a lot of gore, in books or movies, so this book sounds perfect for me! Thanks for sharing your review, definitely going to be reading this one! This book seems very interesting. I'll have to check it out! I'm normally not real influenced by covers but even if everyone wasn't raving about this book, I'd have to have it if only for the awesome cover. Plus I love a good zombie book. I don't consider myself a zombie fan either, but this book is tempting.